Don't you love to buy beads when they're on sale? Even if I don't have any idea what I want to do with them, when my beady little eyes see them, I sometimes pounce. Yay! Now the beads have a home! Note: Since the time this tutorial was first posted, the original beads are no longer available, so I have inserted some suggestions for substitutions below. 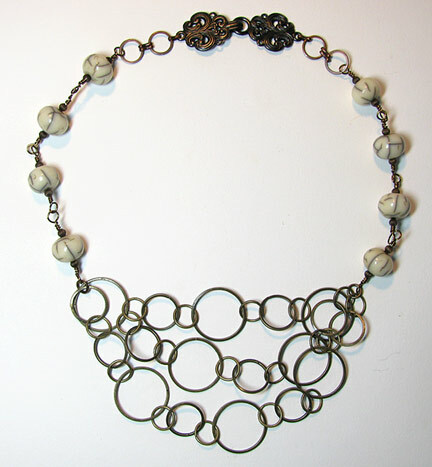 However, I think this necklace style would look great in many different colors and in different combinations of metals. 1. 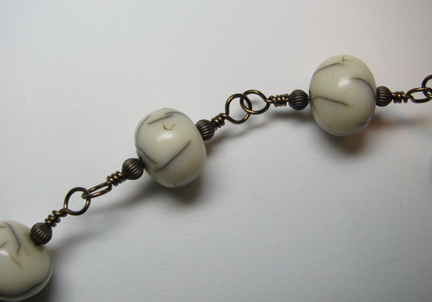 Make two beaded chains by turning wrapped loops, using the focal beads, small round brass beads or bead caps, and brass wire. Use the file to smooth any sharp ends. 2. 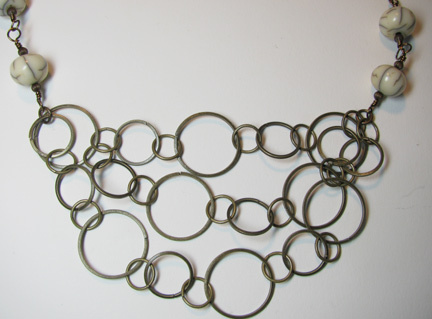 Fold a 2 ft length of interesting chain into thirds, but not necessarily even thirds. Use a jump ring at each end to gather them up. Attach the chain ends to the beaded chains using the same jump rings. 3. Attach the other ends of the beaded chains to short lengths of a second style of chain (smaller antique gold colored). 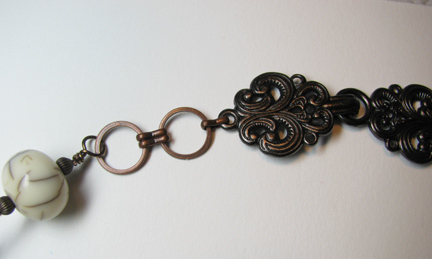 Attach the other ends of the chains to the clasp halves. That looks great Cyndi! I'm glad you said that about buying beads on sale, I've started doing that and was afraid I was developing beading OCD issue!